1999 Plymouth Prowler For Sale In Medford, Wisconsin 54451 This 1999 Plymouth Prowler is a rare find with only 2,500 ever produced! The 1999 Plymouth Prowler will only increase in value. This is your opportunity to acquire an attractively priced, like new and always garage kept Prowler Convertible that is in excellent condition. This Plymouth Prowler has a flawless Yellow Exterior paired with a sleek black interior, and is fully powered featuring a folding convertible top.This Prowler is fun to drive and looks even better than the photos could ever justify, there is not even a stone chip in the paint! With only 4,500 miles you can be sure that the wind will be blowing through your hair for many years to come with this beauty. This Prowler featured a 3.5 Liter Chrysler SOHC 24 Valve V6 engine that is rated at 214 Horsepower (160 kW; 217 PS) at 5850 rpm and has been upgraded to a more powerful aluminum-block, 253 hp (189 kW; 257 PS) at 6400 rpm version of the engine. It offers a Four Speed auto-stick semi-transmission,power windows, seats, locks and cruise control. The transmission was located at the rear of the vehicle and joined to the engine by a torque tube that rotated at engine speed, an arrangement similar to that used by the C5 Corvette, Porsche 944, and Alfa Romeo 75, and helped to facilitate a desirable 50-50 front-rear weight distribution. The Prowler was the first rear-wheel drive Plymouth since the 1989 Plymouth Gran Fury and would stand as the last Plymouth model with that layout. While criticized for having only a V6 engine, Chrysler's High Output 3.5 had a horsepower rating similar to (or higher than) the company's Magnum V8s of that era. While not making nearly as much torque as a V8, Prowler's light weight helped to achieve rapid off-the-line acceleration.!! 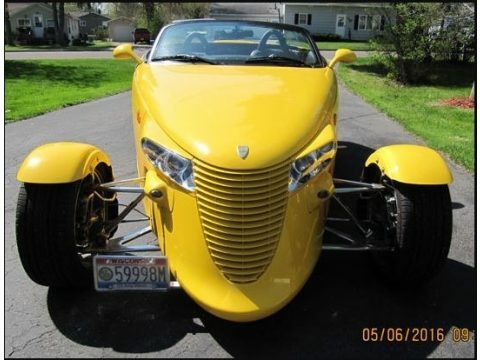 This Rare Yellow Edition 1999 Plymouth Prowler has been meticulously maintained never driven on a wet road, which has enabled it's like new condition. The ugly bumpers have been removed to give it a street rod look. The muffler has been replaced to give it deep growl. Both of these items come with the car. It has never been smoked in, and we are sure you will not find another 1999 Plymouth Prowler in this condition for the price. It is competitively priced so don't miss your chance to own this one of a kind car! Call for more information on how YOU can get behind the wheel today!